The History of CLASSIC EGYPTIAN ARABIANS has open a new chapter. After 20 years at home in South of France, we decided to move back to Germany. The time in France has been a milestone in our life. 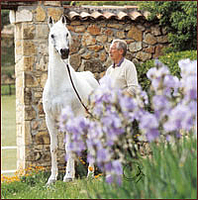 We bred beautiful horses and we had the chance to sell to several countries such as Italy, the UK, Sweden, Spain, Germany, and the Middle East including Qatar, the UAE, Kuwait, Jordan, Egypt, Saudi Arabia, and Morocco. At the same time, we imported the living legend Alidaar (Shaikh Al Badi x Bint Magidaa), without question one of the best stallions that ever touched the sand of the desert. The gentlemen Lohim (Ansata Halim Shah x Lohelia by Morafic) and Ali Barba (Ruminaja Ali x Alidaarlin) also came to Europe as well as a good group of mares including AK Ghazala, AK Bint Nabilah, AK Sherifa, Dorian Shah Halima, Rasdani, the beautiful AK Nawaal, Nilequest Sharah, Monisa Halima, the high-selling mare Sajida,, her dam Ione, HMT Princess Karima, HMT Fernazza, and Sarameena, dam of El Lahab, just to mention a few. They have given us and several breeders the chance to add fresh blood, and they had a great influence on the straight Egyptian breeding in Europe. 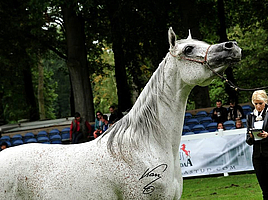 Classic Egyptian Arabians became a trademark and horses such as Classic Rayan, Gold Stallion in Germany, Classic Mansour, Classic Malak, Classic Arif, now at home in Saudi Arabia, Classic Ameer Ali, as well as the mares Classic Medaba, Classic Rashma, dam of Classic Rayan, multiple-champion mare and Top Five Paris, Classic Madaraa, Classic Yosreia, Classic Dahra, the most beautiful dam of Authentic Dahman, since sold to Qatar, and Classic Aldaraa, the queen and top producer at Bebo Stud in Egypt. All of these horses are the result of careful selection by pedigree, type and overall quality. We are proud and happy to celebrate 40 years of breeding straight Egyptian Arabian horses and to hand over our daughter, Susanne, our stallions Lohim (Ansata Halim Shah x Lohelia) and Classic Rashman (Authentic Dahman x Classic Rashma) together with the collection of top mares that are the foundation to continue our dream: pure-bred Arabian horses in the tradition of Bedouins. With the move back to Germany after spending 20 years in the south of France, the dream of Ursula and Willi Poth, to continue their world-regarded breeding programme, became a reality. With health problems needing a decision to be made, we thank Allah that our daughter Susanne, who has spent her life with Arabian horses, was ready and willing to take over the management of our selected collection of straight Egyptian Arabian horses. 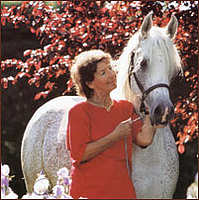 Today, two stallions and 10 females of international standard are the basis for our stud, founded in 1972. We are still determined that purity it is our goal, to keep our bloodlines as clean as possible, following the tradition of the Bedouins. We would like to thank all our friends worldwide for the faith and honour that they have given us, as well as exchanging ideas to become a member of this community. We do hope that our daughter will get the same chances as we had, finding open doors and being able to meet and welcome breeders and friends from all over the world, here at our new farm in Germany. The farm is located in the beautiful countryside of southern Germany, just an hour’s drive from Stuttgart Int. Airport. We would like to invite you to visit us, we promise: you will not be disappointed. The sun went down, the birds fell silent. the uncrowned king has abdicated. He came in from the pasture, lay down in fresh straw, breathed deeply and fell asleep, all according to his character, to begin the journey to the ever green pastures. More than 20 years he was a family member, friend and comrade. He was an absolute dream, an Arabian stallion of a special class, characterized by its outstanding type, which he further gave his descendants, synonym for "Classic" with friends around the world. We will always be grateful for the time together and never forget you, We miss you. Ursula, Susanne, Christian and Willi Poth. ASIL CLUB meeting 2015 – the mares of Classic Egyptian Arabians. Klick here to see the movie.